Comes in Black,Red & Cream. Cooker comes as standard Nat Gas. If LPG is required the cooker must be delivered to the customer first. Once it's delivered you then need to call 01 8623411 where you order the LPG kit and it's sent out free of charge within 2-3 woking days of the call. Note that this is under Irish Law and this states that all these parts MUST be fitted by an RGII registered gas engineer and this is why this procedure is in place. 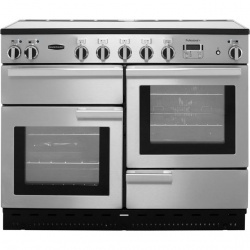 Treat guests to your incredible culinary creations with this cream and chrome dual fuel range cooker from Rangemaster. It has 4 cavities, including 2 ovens, a grill and a storage compartment. 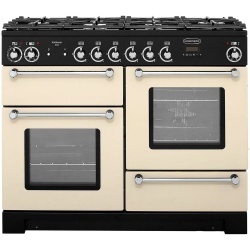 You’ll love this model’s main electric conventional oven as heat rises inside, helping you perfectly roast a chicken at the top where it’s hotter, while gently baking a mouth-watering Victoria sponge at the bottom. It also has a separate electric grill which offers even more cooking options. With a generous 6 burner gas hob, you can boil vegetables, simmer a delicious sauce and flash-fry a steak all at once too, while cast iron pan supports keep your pots secure. 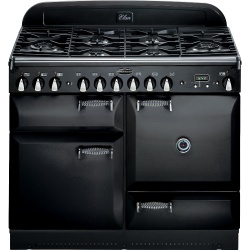 Prepare plenty of delicious dishes with this dual fuel Rangemaster range cooker in black and chrome. With 4 cavities including 2 ovens, a grill and a slow cook oven, you’ll have lots of ways to get creative. The main electric fan oven circulates heat so food cooks evenly on every shelf – great if you love to batch bake. There’s an electric grill as well, which is handy for crisping your pizza topping, or making tasty cheese on toast. This model’s super-spacious 5 burner gas hob gives you more than enough room for your cookware, so you can simmer soups and sauces while the vegetables are boiling. It also has cast iron pan supports which are really sturdy and hard-wearing. For a distinctly traditional range cooker, the Elan boasts classically styled details such as elegant spiral handles, carefully crafted controls and curvaceous doors. Gloss Black with chrome trim, this range suits every scheme and kitchen design. With the Elan, you’ll also get a flexible fan oven, which draws air from the interior of the oven then heats it up and forces it back down into the cavity for even distribution and uniform cooking on every level. The dual circuit glide-out grill, Handyrack and storage drawer are all designed to make your life easier, while cast iron pan supports, multi-ring burner, wok cradle and griddle will bring a professional touch to your kitchen and offer you the flexibility to experiment with new dishes and flavours. 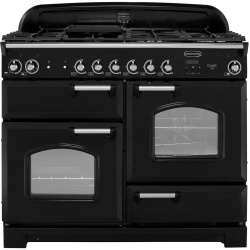 Of course, as with all Rangemaster range cookers, the Elan doesn’t just look good on the outside. The build quality and components are amazing too. To ensure you can simmer, sauté, boil and bake for years to come, each cooker is made with a Tri-tonne frame, multi-glaze oven door, spill-guard hotplates, EasyCook controls and Endurance finish – all checked and tested prior to delivery. A Rated ovens giving the best possible energy efficiency. Multifunction oven, allows food to be cooked to perfection by selecting the correct function for the food. Griddle, dishwasher safe cast aluminium griddle for cooking a variety of food in a healthy way on one surface. Handyrack, adjustable rack attached to oven door making it easy to tend to roasts. Catalytic liners, the cook clean liners absorb fat and steam during cooking, and release these deposits to the base when above 200°C, ensuring that the oven is kept as clean as possible with the minimum effort. Wok cradle, sturdy durable and hard wearing for stable wok cooking, easily removable and dishwasher safe for ease of cleaning. Timer, for added peace of mind when cooking unattended.